Mumbai: Railway Protection Force (RPF) personnel, along with some other people, saved a woman passenger’s life while she was boarding a train at Central Railway Station in Mumbai. The incident happened on Wednesday. 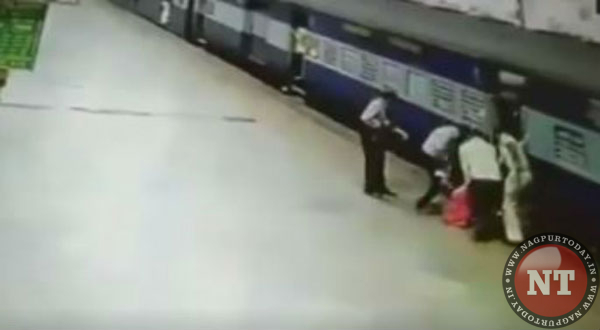 In the video shared by news agency ANI, the RPF personnel and others can be seen rescuing a woman from falling into the gap between the bogie and the platform after she tripped while boarding a train at platform number 4 of the railway station. Earlier on February 16, in a similar incident, an alert ticket checker saved the life of a man as he was trying to board a moving train at Kalyan railway station. The man, identified as Sandeep Sonkar, tripped while boarding the train and the ticket collector, reacting in a swift manner, pulled him away from the coach, the CCTV footage showed. Sonkar is 20-year-old and is a resident of Uttar Pradesh.